What Is Ready-to-Use Therapeutic Food? UNICEF is the global leader in RUTF procurement, purchasing and distributing 80 percent of the world's supply. Pierre's mother died shortly after he was born. With no job in a country ripped apart by conflict, Prosper provided for his family by collecting corn from the dwindling supplies at a nearby farm. But as Pierre’s weight steadily dropped and he grew sicker, refusing to eat, Prosper looked to traditional medicine to help his son, thinking he couldn't afford hospital care. Prosper's dilemma is all too common in CAR, where years of sectarian violence have created a terrible crisis for children, making it one of the most dangerous places in the world to be a child. An estimated 38,000 children under five are projected to suffer severe acute malnutrition (SAM) in 2019. It's an illness that can be prevented and treated if caught in time, but according to Jacqueline Tchebemou, a UNICEF-supported doctor at CAR's only pediatric hospital, children often don't get the medical care they need because parents like Prosper can't afford to provide for them or get them to the hospital in time. But thanks to UNICEF and Ready-to-Use Therapeutic Food (RUTF), Pierre got the help he needed. The doctors at the Bangui Pediatric Hospital, a lifeline for children suffering from the most severe cases of malnutrition, treated him with RUTF, a tasty nutrient-packed paste UNICEF has found to be the most effective tool for treating acute and severe acute malnutrition. RUTF is used by UNICEF to help the millions of children threatened by acute malnutrition worldwide. It doesn't require refrigeration and stays fresh for up to two years. Best of all, no mixing with potentially contaminated water is required. Each packet comes ready to use. All parents have to do is open the packet, give it to their children and watch them grow healthy and strong. UNICEF is the global leader in RUTF procurement, purchasing and distributing 80 percent of the world's supply. UNICEF works with manufacturers to increase supplies of the product and keep prices down. 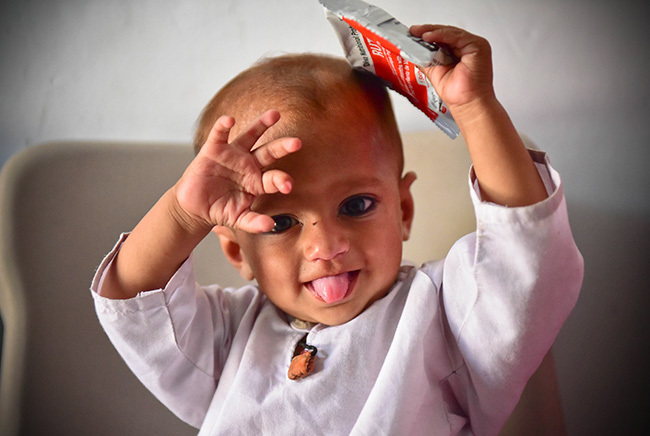 One carton of RUTF contains 150 packets, enough for one six- to eight-week course of treatment to restore the health of a severely malnourished child. In Pakistan, 10-month-old Younas was brought to a UNICEF-supported clinic in South Punjab by his mother. He was weak and losing weight each day, and instead of learning to crawl and take his first steps, he mostly cried and slept. "I breastfeed him and give him buffalo milk, but he keeps getting diarrhea," his mother recalls telling the health workers. Their diagnosis was quick and effective. Younas was suffering from SAM, a major health issue for both children and their mothers in rural Pakistan. But after seven weeks on a diet of therapeutic food, he began to recover. And thanks to the health and nutrition training his mother received at the clinic, she now knows what he needs to continue growing healthy and strong. Malnutrition is a silent threat to millions of children. The damage it does can be irreversible, robbing children of their mental and physical potential. 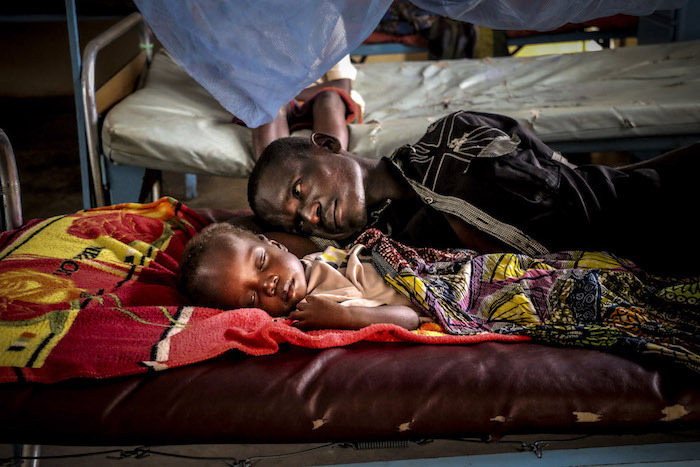 UNICEF was on the ground, providing lifesaving treatment to children suffering from SAM, counseling to caregivers on how to feed infants and young children, emergency primary health care services and safe water. "Malnutrition is a silent threat to millions of children," says UNICEF Director of Emergency Programs Manuel Fontaine. "The damage it does can be irreversible, robbing children of their mental and physical potential. In its worst form, severe malnutrition can be deadly." This year, UNICEF will treat 4.2 million children suffering from severe acute malnutrition.